Gonatopsis japonicus Holotype: immature female, ML=150 mm, MW=27 mm, FL=79 mm, FW=74 mm, LAII=82 mm, collected with squid jigging at the subsurface layer of the Sea of Japan (38-42.0 N, 131-17.3 E). Gonatopsis japonicus was described by Okiyama (1969) based on two immature females collected by squid jigging from the sub-surface layer in the Sea of Japan. Nesis (1997) considered that G. japonicus was a juvenile of G. makko described by Okutani and Nemoto in 1964. Although G. makko is a preceding name, Nesis recomended to apply G. japonicus instead of G. makko due mainly to the bad condition of G. makko types. However, complete development of arm hooks and pigmentation on beaks of the holotype (150 mm ML) indicate that G. japonicus may mature at small size. In addition, fin size and proportion are apparently different from G. makko which supports G. japonicus as a vallid species. G. japonicus has five rows of teeth on the radula which places this species into genus Gonatopsis sensu stricto. slender muscular mantle with relatively large, narrow fins and long attenuate tail. large head, broader than mantle opening. robust arms bearing well-developed heavy hooks. 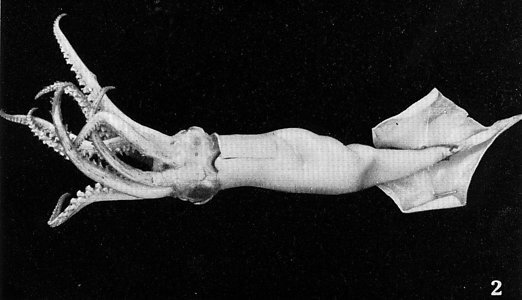 sub-equal arms, the longest about 55% of mantle length. five rows of teeth on the radula. Arms robust, sub-equal, slightly longer than 1/2 ML except shortest arm IV (43%ML). Hooks on arm I-III well developed, 57-61 in number. Marginal suckers on arm I-III small, 70-73 in number. Suckers on arm IV 145-157 in number. Figure. Diagram showing the arrangement of armatures on the right dorsal arm of G. japonicus. Head large, ovoidal in shape, broader than mantle opening. Funnel relatively small, dorsal funnel organ inverted V-shaped, ventral pads small oval in shape. Funnel cartilage lanceolate and slightly curved inward, nuchal cartilage elongated saddle-shaped. Figure. Frontal views of funnel organs and locking cartilages of G. japonicus. a - Funnel organs. b - funnel cartilage. c - nuchal cartilage. Scales in mm. Fin lenght slightly longer than width, about 1/2 mantle length. Tail long, about 1/2 fin length, accutely elongated posterior tip. Beaks darkly pigmented indicating the specimen is nearly adult. Upper beak with acutely pointed rostral tip. Lower beak with curved jow edge, short wing, and tall lateral wall. Central tooth tricuspid, marginal cusps long, curved, unicuspid. Figure. 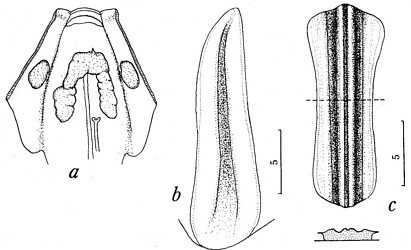 Lower beak, upper beak and radula of G. japonicus. Scales in mm. Gladius long, penniform; lateral plates widest at middle. Posterior 3/16 of gladius with secondary lateral plates. Figure. Gladius of G. japonicus in ventral view with shape of section of 4 different positions of gladius. The distribution of Gonatopsis japonicus is confined to the Sea of Japan and southern part of the Okhotsk Sea. Figure. Distribution of Gonatopsis japonicus. Dark pink area indicates known range; light pink area indicates inferred range. Chart modified from Okutani, et al. (1988). Okiyama, M. 1969. A new species of Gonatopsis from the Japan Sea, with the record of a specimen referable to Gonatopsis sp. Okutani, 1967 (Cephalopoda: Oegopsida, Gonatidae). Seto Marine Biological Laboratory, 17(1): 19-32, pl.I-IV. Page: Tree of Life Gonatopsis japonicus Okiyama 1969. Authored by Tsunemi Kubodera. The TEXT of this page is licensed under the Creative Commons Attribution-NonCommercial License - Version 3.0. Note that images and other media featured on this page are each governed by their own license, and they may or may not be available for reuse. Click on an image or a media link to access the media data window, which provides the relevant licensing information. For the general terms and conditions of ToL material reuse and redistribution, please see the Tree of Life Copyright Policies.